An international team of conservationists discover a new primate species in the rainforest of Peru. Unnoticed by science, an undescribed species of titi monkey turned out to live in the forests along the Urubamba River, in Central Peru. This was discovered by a research team of the Peruvian NGO Proyecto Mono Tocón, during one of their expeditions through the rainforests of Peru. In 2009, the one of the researchers was already in the area, but he did not managed to find the species. At the end of 2013 the weather conditions were better and the expedition team found the primate. The little monkey, smaller than a cat, has a jet black mask and a brown body. Each morning it advertises its presence by a spectacular song, which carries far through the woods. Different groups answer each other and defend as such their territory. During the expedition the team also rediscovered another species of titi monkey, already described in 1914 but since then forgotten by science. The publication of these discoveries, in the specialized journal Primate Conservation, changes completely existing tviews on the systematics and distribution of titi monkeys in this part of South-America. Background: Much of our knowledge on biodiversity comes from collections in natural history museums. In the 19th and 20th century collection expeditions were organized, with the goal to describe the biodiversity of our planet. In 1927 the American Natural History Museum in New York received a collection of brown titi monkey (scientific name: Callicebus) skins from Central Peru. For many years nobody paid attention to these specimens. When in 1990 the renowned mammologist Philip Hershkovitz studies the specimens, he notices their resemblance to the Brazilian brown titi monkey (Callicebus brunneus, described in 1842 from specimens collected in Brazil), and decides to classify them under the same species. Since then most scientists consider all titi monkey living in the area between the collection localities in Brazil and Peru to belong to the same species, the Brazilian brown titi monkey. Doubt: Due to his involvement in several conservation projects in Peru, the Dutch conservationist Jan Vermeer has become interested in the systematics and distribution of the many primate species in Peru. “While early researchers based their research on information in literature and collections in museums, I could made use of a more modern source of information, the Internet”, says Jan Vermeer. “The Internet is full with pictures of titi monkey, often posted by tourists that have been somewhere in the jungle and who want to share their experiences with the world. An unexpected valuable source of information for scientists”. He noticed that on pictures most titi monkeys of southern Peru were not brown, but reddish. Could the situation be different then described in literature? Were the specimens in the American Natural History Museum really collected in Peru? Were these animals the same species as Brazil? “There was only one way to solve the lack of clarity, and that was by making an expedition to the area in Peru where the AMNH specimens were said to be collected”, according to Vermeer. The expedition: In 2007 Vermeer initiated together with a Spanish biologist, Antonio Bóveda, and a group of young Peruvian conservationist the NGO Proyecto Mono Tocón. The main goal of this organization is the conservation of the critically endangered San Martin titi monkey (scientific name: Callicebus oenanthe), through research, environmental education and the creation of protected areas with local communities and authorities. The members of the NGO are very active and are also interested in other Peruvian primate species and their conservation. The head of research, Julio C. Tello-Alvarado, and two young students, are keen to accompany Vermeer with the quest for titi monkeys in Central Peru. All team members have ample experience in field surveys. During a short visit in 2009 it had become clear that the best period for an expedition would be November/December. There would have been enough precipitation to navigate the smaller rivers (that are almost without water during the dry season), but not that much that all land along the rivers would be flooded. The team should be able to penetrate deep into the interior of the forest, in search of titi monkeys. Several organizations understood the importance of the study and offered financial support. These included conservation organizations as Primate Conservation Inc. and the Primate Action Fund of Conservation International, but also a group of European zoos that are loyal supporters of Proyecto Mono Tocón. Because of this support the team could execute at the end of 2013 a six-week expedition. Boats and guides could be found locally, supplies had to be purchased in the small jungle town of Atalaya, as besides some fish and fruit little would be available in the small settlements along the rivers. Camping would be possible in the villages or simply on the riverbanks. Three rivers, flowing from the south, east and west, join in the study area to continue together as the Ucayali River. This river of almost 2700 kilometers long continues its course northwards, to flow via the Amazon into the Atlantic Ocean. The rivers in the study area could be geographic barriers for the dispersion of titi monkeys, with different species on both sides of each river. Only reddish titi monkeys? : during the first weeks of the expedition the team focused its efforts on the area east if the Urubamba River. This area is sparsely populated and there is little hunting, resulting in healthy populations of primates. One could hear every morning the calling of the titi monkeys along the rivers. However, these titi monkeys were not of the expected brown color, but they were reddish. To what species could they belong? “After studying the available literature and specimens in museums, we concluded that these were the so-called Toppin’s titi monkeys (scientific name: Callicebus toppini). Already described in 1914, but since then entered oblivions and now again under the attention of science, an interesting discovery,” explains Vermeer. Additional research after the expedition revealed that the whole area in the south of Peru, the west of Brazil and the north of Bolivia was probably populated with this species. The discovery: after observing during the first weeks only reddish titi monkeys, the team shifted its attention to the western side of the Urubamba River. There they discovered almost immediately another species of titi monkey. “The titi monkeys on this side of the river matched exactly the specimens I studied in the American Natural History Museum. But they were clearly different from the Brazilian brown titi monkey, and the area between both species is the territory of the Toppin’s titi monkey. Therefore it had to be a new, undescribed species of primate!” says Vermeer. The team succeeded in observing, photographing and filming several groups if the species. Due to a coincidental encounter with a hunter they managed to obtain a skin and a skull of the species, which were deposed as scientific evidence in the natural history museum of Lima. This discovery was a huge reward for the efforts of the team. It was decided to name the species the “Urubamba brown titi monkey” (scientific name: Callicebus urubambensis), after the river where the species was discovered. Difficulties: the expedition was not without difficulties. One of the members needed treatment against malaria in a local hospital, while one of the local guides had to go to the hospital with acute abdominal pain. Contact with local indigenous communities was sometimes difficult, once the team members were even threatened with death by Indians armed with bow and arrow. Caution was therefore provided, even in presence of local guides! Fortunately most communities were hospitable, friendly and cooperative. Important results: the results of the expedition are without doubt very important for science. The discovery of a new species, in an era that many people think that we know everything that is living on our planet, is spectacular. The “rediscovery” of a forgotten species is also an important outcome of the study. “If we want to protect our nature in Peru, we will fist need to know what lives in our country. This kind of research is the basis of future effective conservation strategies”, stresses Tello-Alvarado. Both species do not seem to be threatened, there is some hunting but due to the low human population density and the extensive distribution ranges there is little danger for their future. The ever increasing (illegal) logging and petrol drilling activities are worrisome for the future of the larger species of primates, like woolly and spider monkeys, which were rarely encountered by the team. These species are the first victims of the advancing human activities in the region. 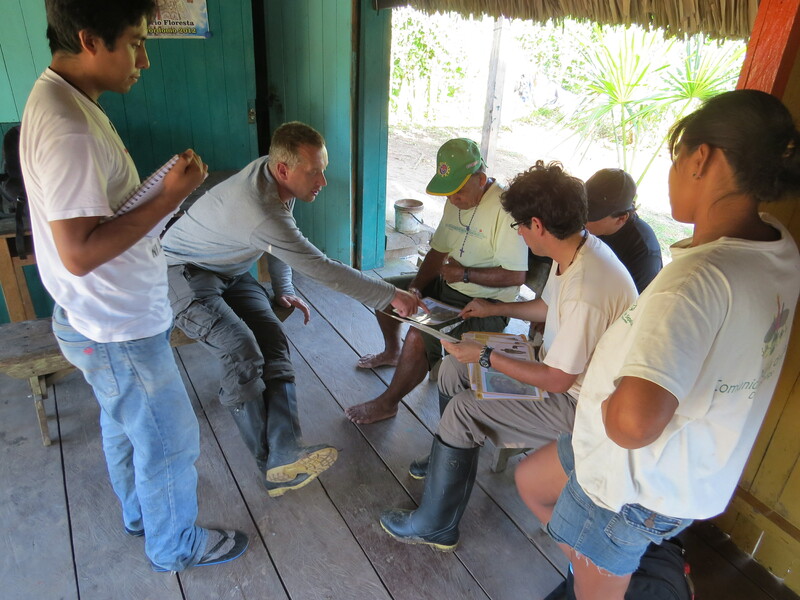 Jan Vermeer (46) is since 2005 active for nature conservation in Peru and other countries. He is the zoological director of Parc Animalier de Sainte Croix in France and founder of Proyecto Mono Tocón. Jan Vermeer is specialized in the taxonomy of titi monkeys (Callicebus) and the systematics and distribution of Peruvian primates. He is also advisor of several international captive breeding programs, including that of the western lowland gorillas. Julio C. Tello-Alvarado (30) is a graduated environmental engineer and since 2008 responsible for the scientific research of Proyecto Mono Tocón. Besides much knowledge on the primates of northern Peru he is a specialist of Peruvian birds and accompanies frequently international ornithologists on their birding expeditions. The photographs and illustrations can be used for publications on this expedition, but only if the source is mentioned.